Hi everyone and welcome to my office. 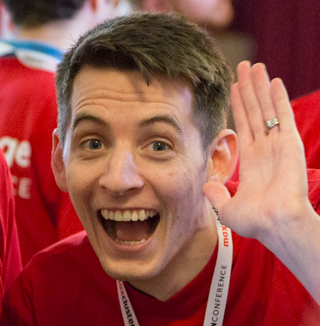 My name is David Manners and I’m here to introduce myself as a Magento Master. I have been working with Magento for five years. I got involved with it when I moved over to work with Sitewards. I’m still at Sitewards. I’m currently Lead Developer here, and I’ve been loving and working with Magento ever since. I think one of the best things about Magento is how good the community is—all the interaction with people, the tools that are available that the community put together and the resources. But that’s not the main reason I got involved with the community. The main reason I got involved is because I love fake internet points and gamification. So, I got involved helping out on StackOverflow answering questions. From then I just got to see the names and faces of people and got to start following them on Twitter and interacting with them, and, through that, I got my first foot in the door in the Magento community. I love working with the Magento community. Without being part of it, I wouldn’t have my own podcast and I wouldn’t have thousands of fake internet points that one day I’ll be able to cash in for beer. The Magento community is unlike any other. It’s a really, really good community. I think it’s a really open community. I enjoy working in the community. What's might the community not know about you? One thing you might not know about me is I do sound and light engineering in my spare time. I have literally, yesterday, just installed a new sound desk. I enjoy doing that as well in my spare time, when I have spare time. The biggest thing I would pass on to other developers is that you can get used to failing. You learn a lot more from failing than you do from succeeding. It’s a real pain to fail the first time around but as long as you learn from it, as long as you progress and change something based on it, then that’s great. If you fail and keep doing the same thing over and over again, then you’re definitely doing something wrong. So learn to fail but learn to improve from the failing. If you could ask anyone at Magento a question, who would it be? What would you ask? I think my biggest thought, my biggest question—I don’t think it’s ever been asked but maybe it has—is, why is Magento called Magento? What’s behind the name of it? That’s something I’ve always wanted to know but never found it out. So if you know, let me know. Who do you hope to see as a Magento Master in 2017 and why? Of course in 2016 I had the privilege of being a Magento Master. For 2017, for the year of 2016, there has been so much going on, so much new stuff in the community so I think unfortunately I probably won’t be able to get Magento Master again in 2017. I will fight you for it, though, I will, because that’s my crown. But as to who could replace me? There are plenty of people, so many more, too many than I would like to say now unfortunately. But there is plenty of cool stuff out there from anything—from security, from training, from all the Magento 2 stuff, there are still other podcasts coming up, and code katas and so much more. This community is growing, this community is thriving, and that’s what we love about it. David is CTO as Sitewards in Frankfurt Germany, who specialize in eCommerce solutions. His main passion is with Magento and other eCommerce software, having worked in that field for the past eight years. He also likes to champion developer welfare and enjoys a challenge with regular expressions. Through the MageEngage YouTube channel, he finds out about the people behind the twitter handles. Meet all of the 2017 Magento Masters and check out our Community Hall of Fame.